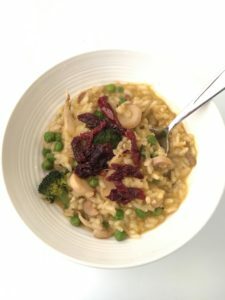 This dairy free risotto is incredibly delicious and tastes rich & creamy. Warm broth in a medium-sized pot, add saffron threads, peas, and lemon zest or lemon juice over low heat. In large pot, saute onions in 1 tbsp avocado oil until translucent. Add arborio rice and additional 1 tbsp avocado oil, saute and stir for 2 minutes. Add garlic, and saute for 1 additional minute. Add 1 cup of warmed broth to rice mixture in large pot. Stir until absorbed. Add asparagus/broccoli, sea salt, and pepper and stir. Continue processes of adding 1 cup of broth at a time and stir until absorbed, then adding another cup until all broth has been used. Meanwhile, in a small saucepan, saute mushrooms and sundried tomatoes for 2 minutes. Combine all ingredients into large serving bowl and serve.